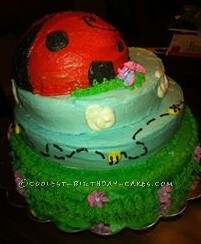 This ladybugcake was made to celebrate a 1st birthday. It was a 4-tier scene cake. 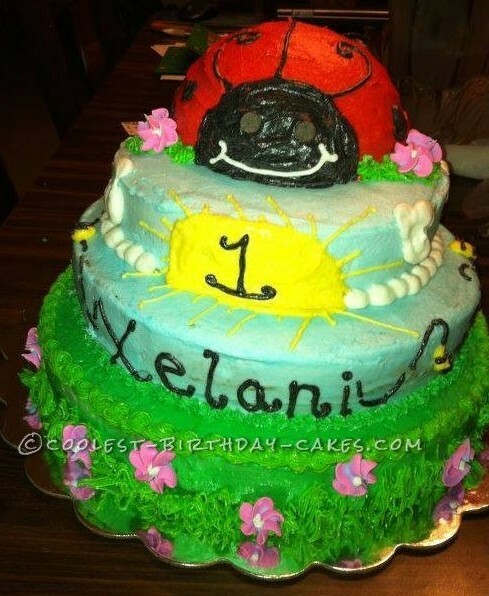 Every tier had a different scene with the top ladybug being the smash cake. The bottom (4th) tier was green with grass and royal icing drop flowers. The third tier was light blue with the birthday girl’s name on the front and buttercream buzzing bees around the sides and back. The second tier was light blue sky with clouds and a big buttercream yellow sun in the front.